Few formulas have proved more successful for Trek than fish-out-of-water time travel comedy, with TOS and TNG mining the well to beloved effect. But how did Voyager fare when its turn came to follow up its predecessors' triumphs? This week hosts Cam Smith and Tyler Orton, along with special guest Tony Geluch, follow surly Captain Braxton back to the glorious year of 1996 in order to revisit the popular double-sized season 3 adventure Future's End. Over the course of their wild and wacky odyssey the trio ponder the accuracy of the show's take on the era which birthed it, debate whether racist redneck subplots are ever a good thing, and reconsider the efforts of big deal guest stars Ed Begley Jr. and Sarah Silverman. So toss on your best neutral-toned suit and get hyped because the 90s are back, baby! Wanna appear on the show? Shoot us a 30 to 60-second audio clip telling us your thoughts on FUTURE'S END and you could take the spotlight in an upcoming program! You can also send any other questions, topic ideas or feedback to subspacetransmissionspod@gmail.com! Join us next week as we scour Trek actors' filmographies for hidden gems. 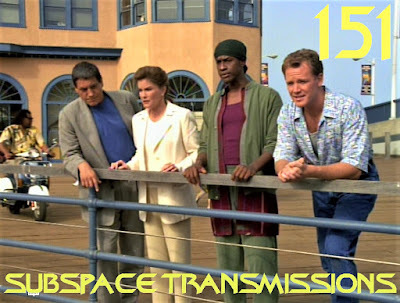 #148 - ARE STARFLEET CADETS THE WORST?